Definition at line 48 of file llscrollbar.h. Definition at line 52 of file llscrollbar.h. Definition at line 50 of file llscrollbar.cpp. References LLView::addChild(), FALSE, LLRectBase< Type >::getHeight(), LLRectBase< Type >::getWidth(), mOrientation, LLView::mRect, onLineDownBtnPressed(), onLineUpBtnPressed(), SCROLLBAR_SIZE, LLView::setFollowsBottom(), LLView::setFollowsLeft(), LLView::setFollowsRight(), LLView::setFollowsTop(), LLButton::setHeldDownCallback(), LLRectBase< Type >::setLeftTopAndSize(), LLRectBase< Type >::setOriginAndSize(), LLUICtrl::setTabStop(), LLFontGL::sSansSerif, updateThumbRect(), and VERTICAL. Definition at line 146 of file llscrollbar.cpp. Definition at line 538 of file llscrollbar.cpp. References getDocPosMax(), llclamp(), mCallbackUserData, mChangeCallback, mDocPos, S32, and updateThumbRect(). Referenced by handleHover(), handleKeyHere(), handleScrollWheel(), pageDown(), and pageUp(). Definition at line 455 of file llscrollbar.cpp. References LLWindow::convertCoords(), LLView::draw(), f, LLWindow::getCursorPosition(), getDocPos(), getDocPosMax(), LLFocusMgr::getFocusColor(), LLRectBase< Type >::getHeight(), LLCriticalDamp::getInterpolant(), LLFocusMgr::getKeyboardFocus(), LLFocusMgr::getMouseCapture(), LLImageProviderInterface::getUIImageByID(), LLView::getVisible(), LLRectBase< Type >::getWidth(), LLView::getWindow(), gFocusMgr, gl_draw_scaled_image_with_border(), gl_rect_2d(), glBlendFunc, LLView::hasMouseCapture(), HORIZONTAL, lerp(), LLRectBase< Type >::mBottom, mCurGlowStrength, LLView::mEnabled, mHoverGlowStrength, LLRectBase< Type >::mLeft, mOnScrollEndCallback, mOnScrollEndData, mOrientation, LLView::mRect, mThumbColor, mThumbRect, mTrackColor, LLCoord::mX, LLCoord::mY, LLRectBase< Type >::pointInRect(), S32, LLUI::sAssetsGroup, LLView::screenPointToLocal(), SCROLLBAR_SIZE, LLUUID::set(), LLUI::sImageProvider, LLRectBase< Type >::stretch(), TRUE, and VERTICAL. Definition at line 89 of file llscrollbar.h. Referenced by LLTextEditor::appendText(), LLTextEditor::changePage(), draw(), LLTextEditor::drawCursor(), LLTextEditor::drawSelectionBackground(), LLTextEditor::drawText(), LLTextEditor::endOfDoc(), LLTextEditor::getCursorPosFromLocalCoord(), LLScrollListCtrl::getScrollPos(), LLScrollableContainerView::handleDragAndDrop(), LLViewerTextEditor::handleHover(), LLTextEditor::handleHover(), LLViewerTextEditor::handleMouseDown(), LLViewerTextEditor::handleMouseUp(), LLTextEditor::handleMouseUp(), LLTextEditor::handleNavigationKey(), LLScrollableContainerView::needsToScroll(), LLTextEditor::replaceTextAll(), LLScrollableContainerView::scrollToShowRect(), LLScrollListCtrl::setScrollPos(), and LLTextEditor::updateScrollFromCursor(). Definition at line 96 of file llscrollbar.h. References llmax(), mDocSize, and mPageSize. Referenced by LLTextEditor::appendText(), changeLine(), LLTextEditor::changePage(), draw(), LLTextEditor::endOfDoc(), LLScrollableContainerView::handleDragAndDrop(), LLTextEditor::handleHover(), handleHover(), handleKeyHere(), LLViewerTextEditor::handleMouseDown(), LLViewerTextEditor::handleMouseUp(), LLTextEditor::handleNavigationKey(), LLScrollListCtrl::reshape(), setDocParams(), setDocPos(), setDocSize(), setPageSize(), LLTextEditor::updateScrollFromCursor(), and updateThumbRect(). Definition at line 84 of file llscrollbar.h. Referenced by LLScrollListCtrl::setEnabled(), LLTextEditor::setHideScrollbarForShortDocs(), and LLTextEditor::updateLineStartList(). Definition at line 93 of file llscrollbar.h. Referenced by LLTextEditor::changePage(), LLScrollListCtrl::handleKeyHere(), LLScrollListCtrl::setEnabled(), LLTextEditor::setHideScrollbarForShortDocs(), LLTextEditor::updateLineStartList(), and LLTextEditor::updateScrollFromCursor(). Definition at line 567 of file llscrollbar.cpp. Definition at line 562 of file llscrollbar.cpp. Definition at line 409 of file llscrollbar.cpp. Definition at line 275 of file llscrollbar.cpp. References changeLine(), LLView::childrenHandleMouseUp(), f, FALSE, getDocPosMax(), LLRectBase< Type >::getHeight(), LLView::getName(), LLRectBase< Type >::getWidth(), LLView::getWindow(), LLView::hasMouseCapture(), height, llclamp(), lldebugst, llendl, LLRectBase< Type >::mBottom, mDocChanged, mDocPos, mDragStartX, mDragStartY, mLastDelta, LLRectBase< Type >::mLeft, mOrientation, mOrigRect, LLView::mRect, LLRectBase< Type >::mRight, mThumbRect, LLRectBase< Type >::mTop, NULL, S32, SCROLLBAR_SIZE, LLWindow::setCursor(), TRUE, UI_CURSOR_ARROW, VERTICAL, and width. Definition at line 572 of file llscrollbar.cpp. References changeLine(), FALSE, getDocPosMax(), LLView::getVisible(), KEY_DOWN, KEY_END, KEY_HOME, KEY_PAGE_DOWN, KEY_PAGE_UP, KEY_UP, mDocPos, LLView::mEnabled, mStepSize, pageDown(), pageUp(), and TRUE. Definition at line 230 of file llscrollbar.cpp. References LLView::childrenHandleMouseDown(), gFocusMgr, HORIZONTAL, LLRectBase< Type >::mBottom, mDragStartX, mDragStartY, mLastDelta, LLRectBase< Type >::mLeft, mOrientation, mOrigRect, LLRectBase< Type >::mRight, mThumbRect, LLRectBase< Type >::mTop, NULL, pageDown(), pageUp(), LLRectBase< Type >::pointInRect(), LLFocusMgr::setMouseCapture(), TRUE, and VERTICAL. Definition at line 431 of file llscrollbar.cpp. References FALSE, gFocusMgr, LLView::handleMouseUp(), LLView::hasMouseCapture(), NULL, LLFocusMgr::setMouseCapture(), and TRUE. Definition at line 394 of file llscrollbar.cpp. References changeLine(), FALSE, LLView::getEnabled(), LLView::getVisible(), LLRectBase< Type >::localPointInRect(), LLView::mRect, mStepSize, and TRUE. Referenced by LLTextEditor::handleScrollWheel(), and LLScrollListCtrl::handleScrollWheel(). Definition at line 638 of file llscrollbar.cpp. Definition at line 630 of file llscrollbar.cpp. Definition at line 621 of file llscrollbar.cpp. References changeLine(), mDocSize, mPageSize, and TRUE. Referenced by handleKeyHere(), handleMouseDown(), and LLScrollableContainerView::pageDown(). Definition at line 613 of file llscrollbar.cpp. 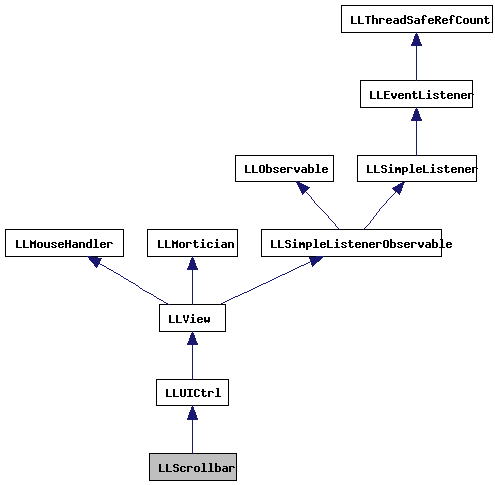 Referenced by handleKeyHere(), handleMouseDown(), and LLScrollableContainerView::pageUp(). Definition at line 448 of file llscrollbar.cpp. Referenced by LLScrollListCtrl::setHeadingHeight(), and LLScrollableContainerView::updateScroll(). Definition at line 151 of file llscrollbar.cpp. References getDocPosMax(), llclamp(), mDocChanged, mDocPos, mDocSize, TRUE, and updateThumbRect(). Definition at line 160 of file llscrollbar.cpp. References getDocPosMax(), llclamp(), mDocChanged, mDocPos, TRUE, and updateThumbRect(). Referenced by LLTextEditor::changePage(), LLTextEditor::endOfDoc(), LLScrollableContainerView::goToBottom(), LLScrollableContainerView::goToTop(), LLScrollableContainerView::handleDragAndDrop(), LLViewerTextEditor::handleHover(), LLTextEditor::handleHover(), LLViewerTextEditor::handleMouseUp(), LLTextEditor::handleMouseUp(), LLTextEditor::handleNavigationKey(), LLTextEditor::replaceTextAll(), LLScrollableContainerView::scrollToShowRect(), LLScrollListCtrl::setScrollPos(), setValue(), LLScrollableContainerView::updateScroll(), and LLTextEditor::updateScrollFromCursor(). Definition at line 168 of file llscrollbar.cpp. Referenced by LLScrollListCtrl::addItem(), LLScrollableContainerView::reshape(), LLScrollableContainerView::scrollToShowRect(), LLTextEditor::updateLineStartList(), LLScrollableContainerView::updateScroll(), and LLTextEditor::updateScrollFromCursor(). Definition at line 106 of file llscrollbar.h. Definition at line 109 of file llscrollbar.h. Referenced by LLTextEditor::LLTextEditor(), and LLTextEditor::setOnScrollEndCallback(). Definition at line 177 of file llscrollbar.cpp. References getDocPosMax(), llclamp(), mDocChanged, mDocPos, mPageSize, TRUE, and updateThumbRect(). Referenced by LLScrollListCtrl::addItem(), LLTextEditor::reshape(), LLScrollListCtrl::reshape(), LLScrollableContainerView::reshape(), LLScrollableContainerView::scrollToShowRect(), and LLScrollableContainerView::updateScroll(). Definition at line 107 of file llscrollbar.h. Definition at line 105 of file llscrollbar.h. Definition at line 104 of file llscrollbar.h. Definition at line 557 of file llscrollbar.cpp. References LLSD::asInteger(), S32, and setDocPos(). Definition at line 186 of file llscrollbar.cpp. References getDocPosMax(), LLRectBase< Type >::getHeight(), LLRectBase< Type >::getWidth(), HORIZONTAL, llclamp(), llmax(), llmin(), LLRectBase< Type >::mBottom, mDocPos, mDocSize, LLRectBase< Type >::mLeft, mOnScrollEndCallback, mOnScrollEndData, mOrientation, mPageSize, LLView::mRect, LLRectBase< Type >::mRight, mThumbRect, LLRectBase< Type >::mTop, S32, SCROLLBAR_SIZE, and VERTICAL. Referenced by changeLine(), LLScrollbar(), reshape(), setDocParams(), setDocPos(), setDocSize(), and setPageSize(). Definition at line 116 of file llscrollbar.h. Definition at line 129 of file llscrollbar.h. Definition at line 123 of file llscrollbar.h. Referenced by handleHover(), setDocParams(), setDocPos(), setDocSize(), and setPageSize(). Definition at line 120 of file llscrollbar.h. Referenced by changeLine(), getDocPos(), handleHover(), handleKeyHere(), setDocParams(), setDocPos(), setDocSize(), setPageSize(), and updateThumbRect(). Definition at line 119 of file llscrollbar.h. Referenced by getDocPosMax(), getDocSize(), pageDown(), pageUp(), setDocParams(), setDocSize(), and updateThumbRect(). Definition at line 126 of file llscrollbar.h. Definition at line 127 of file llscrollbar.h. Definition at line 136 of file llscrollbar.h. Definition at line 137 of file llscrollbar.h. Definition at line 128 of file llscrollbar.h. Definition at line 132 of file llscrollbar.h. Referenced by draw(), setOnScrollEndCallback(), and updateThumbRect(). Definition at line 141 of file llscrollbar.h. Definition at line 118 of file llscrollbar.h. Referenced by draw(), handleHover(), handleMouseDown(), LLScrollbar(), and updateThumbRect(). Definition at line 131 of file llscrollbar.h. Definition at line 121 of file llscrollbar.h. Referenced by getDocPosMax(), getPageSize(), pageDown(), pageUp(), setPageSize(), and updateThumbRect(). Definition at line 138 of file llscrollbar.h. Definition at line 122 of file llscrollbar.h. Referenced by handleKeyHere(), and handleScrollWheel(). Definition at line 135 of file llscrollbar.h. Referenced by draw(), and setThumbColor(). Definition at line 125 of file llscrollbar.h. Referenced by draw(), handleHover(), handleMouseDown(), and updateThumbRect(). Definition at line 134 of file llscrollbar.h. Referenced by draw(), and setTrackColor().